Basic, sleek and very wearable. An authentic design, nicely reflecting the medieval era. 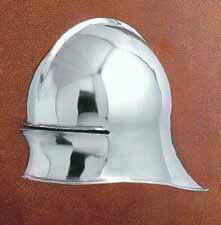 Made from 16 gauge steel, this helmet offers top notch protection for the head, eyes, and neck. Back in the day, it was also often worn with a beaver for throat protection. This page was last modified on 4 May 2014, at 17:50.